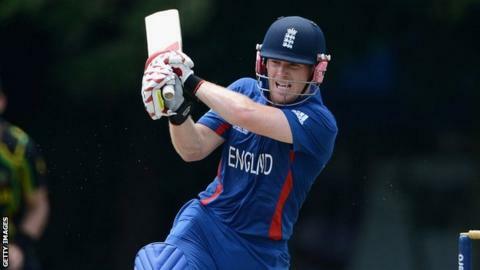 England got absolutely hammered against India in their World Twenty20 group game. They were not good enough in any department and will be the first to admit they paid a very heavy price. It did not come as a huge shock to me because we have had our issues in the past when needing to score against the turning ball on the slow sub-continent pitches, and a lack of experience and cricketing nous was badly exposed. "I don't have a problem with the discrepancy between the prize money for the men's and women's World Twenty20 competitions. Being brutally honest, you have to look at what brings in the money. Do the TV companies pay all this money to watch the women or is it to watch the men? I'm a fan of women's cricket and I want to see it promoted, but it's generally still a part-time sport around the world." It was certainly a wake-up call for England and if they are to stand a chance of defending their trophy, the one player who really needs to start delivering is Eoin Morgan. He is our most experienced and innovative batsman and yet he has not scored more than 27 in any of his last nine Twenty20 innings. Against India, he came in with England in trouble at 18-2, attempted to cut Harbhajan Singh and was bowled for just two. I am a huge Morgan fan. He has been there and done it before and is a superb player under pressure. He is an opposition captain's nightmare because he can score 360 degrees around the ground and you feel you need 12 or 13 fielders to cover all his scoring options. England need him to fire because very few of the other batsmen have as much experience on the big stage. Are we really expecting Jonny Bairstow and Jos Buttler to play consistent match-winning innings in conditions which are foreign to them at such an early stage in their international careers? They are potentially very dangerous batsmen, but you cannot expect players starting out on their international journeys to produce consistently all the time. England have plenty of thinking to do before the Super Eights and the batsmen have got to develop clear game plans to counter any mystery spin. Regardless of the hammering they took, which I hope is just a one-off shocking day at the office, they are still in the competition and the lads will be desperate to hang onto the trophy they won in the Caribbean in 2010. England aside, most of the other big sides performed as we would have expected in the group stage. India look very strong, Pakistan have several match-winners, and although the West Indies' games were disrupted by rain, they showed enough to uphold my belief that they will play a huge part in this tournament. "The Ryder Cup is one of the great sporting occasions and seems to attract fans who wouldn't normally follow golf. People love getting behind a team and watching us get one over on the Americans. I can't wait for it to start and, even though I'm at a wedding on Saturday, I will be following it very, very closely indeed. Come on Europe!" South Africa tick all the boxes, with pace, spin variety and batsmen with Indian Premier League experience, while New Zealand - in Brendon McCullum - have one of the most destructive batsmen in the game. Of the associate nations, Ireland will feel as though they did not live up to their own expectations and a couple of Ireland fans I know were hugely disappointed that they were unable to replicate the form they showed at the last World Cup, when they beat England in such memorable fashion. With none of the so-called minnows able to win a game, some people may question the value of having them in such a high-profile tournament. But the emergence of Afghanistan, who performed creditably against India, is a great example of how the game is growing and why we have to give the smaller sides a chance to play against the big boys in order to learn and develop their game. All the sides competing in the tournament got there on merit because of the qualification process and the majority have all beaten a major cricketing nation in recent times. It did not happen for them this time round, but who is to say they will not learn from the experience and come back as a stronger force at the next World Cup? You only have to look back 30 years or so, when Sri Lanka first came onto the scene. They were not a strong unit but they have gone on to achieve unbelievable success given the size of their population. Like it or not, we are left with the usual suspects for the Super Eights and this is where the tournament really gets started for me. Every match from now on will feature big teams and big names going head to head. Let the fireworks commence.